Roast potatoes topped with melted cheddar cheese, crispy bacon, tomato salad & rocket. Preparation: Preheat the oven 200°C. Prepare all ingredients as indicated above. Potatoes: Cut the potatoes in half lengthways, then make shallow diagonal slices in the flesh one way, and shallow diagonal slices the other way to make a crisscross pattern. Place on a tin foil lined baking tray, drizzle with olive oil and season with salt and pepper and roast for 30 minutes until soft and golden. 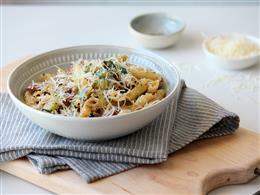 Cheese & egg mix: Add the grated cheddar and ¼ of the bacon bits to the eggs and mix through. Grilled potato: Top the potatoes with the cheese & egg mix, turn the oven on to the grill and place back in the oven to grill for 4-5 minutes until the cheese is melted and golden. 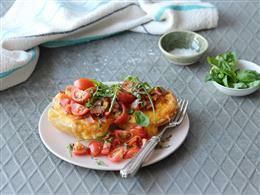 Serve the potatoes topped with the REST of the bacon, tomato salad and rocket.